On May 30, 2018, a dust storm began on Mars. The problem? It never stopped. 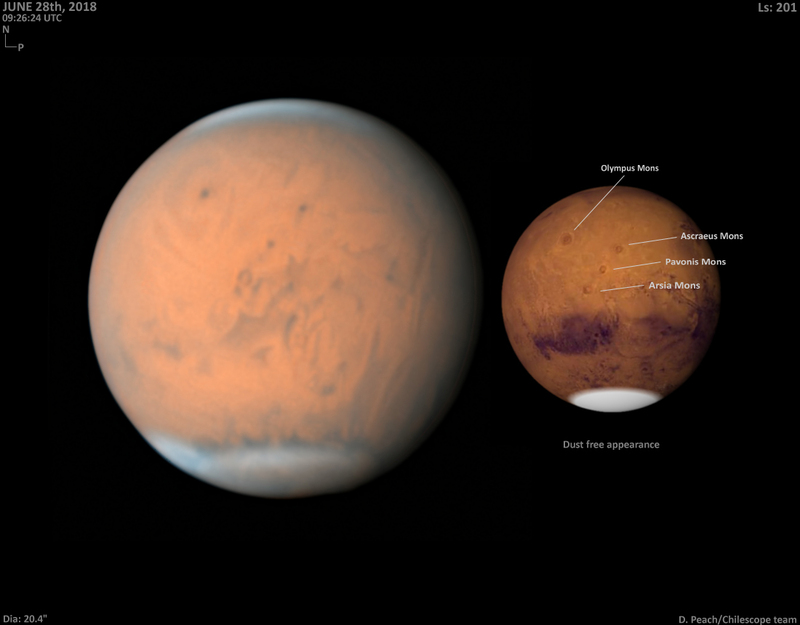 Mars gets seasonal dust storms every year. Usually, they grow for a while, affect local or even regional areas, then die off. But not this one. It kept growing, starting first in the northern hemisphere, then getting so big it crossed the equator and started taking over the southern hemisphere, too. It is now global, completely covering Mars essentially from pole to pole. This is a problem for many reasons. The biggest is that it's interfering with the science missions currently poking and prodding the Red Planet — now redder than usual — such as, for example, the orbiting mappers not being able to see the surface clearly. And the operations of the rovers on the surface are profoundly impacted. The rover Opportunity, which has been on Mars since 2004 (I'll note the primary mission was for it to last three months; imagine buying a car with a 100,000-mile guarantee and having it still working after, say, 6 million miles), is in trouble. The storm reached Opportunity's location in Meridiani Planum just south of the Martian equator, and got so bad that the rover's solar panels weren't getting enough light to provide power (it went from well over getting 600 Watt-hours to just 20). There has been no contact with Opportunity since June 10. It's likely it put itself into sleep mode, awaiting more power to be able to reactivate itself. This is a problem, since it needs power to keep some of its sensitive equipment warm. The good news is that the dust is providing something of a thermal blanket, so the surface of the planet is staying warmer than it usually would. We'll see what happens after this, literally, blows over. BTW, Curiosity uses a nuclear generator for power, so it's OK there. Dust is pretty gritty, though, and can get into moving parts. I haven't heard anything about Curiosity having any issues there, though. This storm comes at an interesting time: Coincidentally, Mars will be at opposition on July 26th of this year. That's when Earth, Mars, and the Sun are on a line, and Mars is as close to directly opposite the Sun in the sky as it can be*. This is great for observing the planet! This means it rises when the Sun sets, so it's up all night. It's also as close to Earth as it can be for the next couple of years (and the closest it will be since about 2003), so it's easier to resolve smaller features on the surface. The problem is that you can't see the features on the surface! They're covered in dust, which is irritating. Mars is small (about 1/2 the diameter of Earth) so it's difficult to pick out surface features unless you have steady skies and high magnification in the first place. I may try with my own 'scope this month, but I don't expect to see much except an ochre ball. Still, if you know of an observatory or astronomy society near you (those links will take you to lists), and they're holding an observing event, you should go. Seeing a fuzzy Mars may not be great, but it's still cool. You can say you saw a global dust storm with your own eyes! Plus, Jupiter and Saturn are up too, and they are always amazing. Venus is up just after sunset right now as well, and it's joined now by elusive Mercury, which will be farthest east (so best seen) on July 11. In the days after it will swing between Earth and the Sun, getting brighter and showing more of a crescent shape, which is pretty cool to see through a telescope. Venus is doing the same thing, though more slowly, and will be crescent-shaped best in September. In the meantime, let's hope this global storm on Mars settles down, and Opportunity is all right. There's a lot of Mars still left to explore. *You'd think that would be 180°, but this gets complicated. That would only happen if the orbit of Mars were exactly in the same plane as Earth's. It's tipped a bit relative to ours, so it's not on the line directly opposite the Sun in our sky. Instead, at opposition, it'll be about 173° from the Sun if you connect along the shortest path. One way to think of it is to say it's 180° around the sky from the Sun, and then about 7° south of the ecliptic, the position of Earth's orbit in the sky. Like I said: This gets complicated.